Convenience stores have been expanding into new services to capture more revenue and increase average ticket size through profit centers like car wash, detailing, and lube. There are many factors to be aware of when adding a car wash or improving on an existing operation. 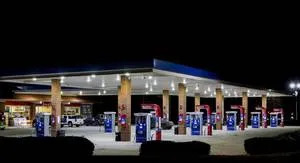 An increasingly common practice of c-stores is to sell at the pump. While customers are purchasing gas, they are offered additional services like an oil change or a car wash. Operators should expect some sales from this feature, but there are ways to generate even more interest in both gas and upsells. Many c-store sites will promote car wash or oil change services through a gas discount. Because gas is a recurring expense, many customers shop around for the best price. According to data from the National Association of Convenience Stores (NACS), “about two in three consumers shopped on price…and most important to those who say they never shop inside the store” (NACS: How Consumers React to Gas Prices). You can make a relatively small sacrifice on gas that will result in a larger average ticket thanks to the car wash. Assuming you have a modern POS system (purchased in the last 15 years) it can be configured to issue gas codes on your receipts. The customer can choose to use the code at the time of purchase or save it for later. Although cigarettes, drinks, and gasoline have been staples of convenience for years, it doesn’t hurt to grow into other areas to increase revenue. As margins on these decline, it becomes even more profitable to add car wash and detailing services. The model for your car wash will depend on your budget and land restrictions. Although a tunnel will provide more revenue than an in-bay automatic, it requires more land and a larger upfront investment. In a crowded market, it’s nearly impossible to raise prices on cigarettes or soda without sacrificing sales to the competition. If you’re the only c-store with a car wash, it’s easier to control your profitability for that service and play around with your pricing strategy. Having multiple profit centers also allows for more consistency across the business, giving you a couple areas to draw people in and capture more of the local traffic. A noticeable difference between standalone car wash sites and car washes that are attached to c-stores is often equipment and upkeep. Many in-bays and smaller tunnels take a back seat to the c-store, although they shouldn’t. If you own a car wash with your c-store, you should focus on the quality of the wash and maintenance of the site. Routine cleaning and equipment upgrades can improve the marketing of your car wash and turn it into a strong profit-yielding business instead of a sideshow. Car washes differentiate their service with speed and wash quality, which relies on equipment and chemical testing. Make sure everything is operational and consider investing in a car-wash-specific point-of-sale system and a dedicated car wash staff. Staffing a car wash and keeping up with repairs is sometimes out of the budget, so partnering with a nearby site can produce similar results. While you are proficient at running a c-store, the car wash next to you is proficient at washing cars and handling a higher volume. You can propose a partnership to sell at the pump and produce codes for redemption at their wash. Additionally, you could sell unlimited memberships for the neighboring site and get a commission on each sale. This could be a strong option for existing c-stores that do not have enough real estate to build on or for those that want to avoid extra labor costs. You can stand out from the pack by offering something unique, and you can also achieve this by bundling services into one site. Becoming a one-stop shop can be difficult, but it builds the average ticket size and improves profitability. One way to achieve this is a branded partnership — a well-known company works with you on the service to create name recognition and trust. You are probably already familiar with this practice in the c-store food and beverage space, but it is also popular for car wash and lube operations. Consumers are willing to pay more for branded products, as seen in gasoline and coffee. Some sites will utilize multiple partners to cover a range of services: Shell gas, Dunkin’ coffee, Valvoline lube, and Armor All car wash products. These are just a couple examples of co-branding and franchising that occur in the c-store space. Your customers are more likely to seek out this business format in an attempt to get things done faster. It’s worth noting that convenience continues to be a strong factor in consumer behavior. Over time, it is a rising priority as people become busier and seek out quick solutions. One common timesaving method is the “one-stop shop” where consumers can pick up multiple products or purchase a variety of services all at once. According to “Your Next Big Category: The Car Wash,” a presentation by NACS, there are some important findings related to car wash and gas station bundles. Survey results discovered a top reason for getting a car wash: “It’s convenient to wash my vehicle while I am doing something else, like buying gas.” In 2016, 58 percent of respondents indicated this was a major influence on their consumer behavior. This represents a significant change in mindset compared to 2014, when 39 percent identified this as a factor in their buying decision. If you provide value to your customers, they will reciprocate. Offering an unlimited program for car washes, or a loyalty program to earn points from the wash, c-store, or gas station are both examples of promotional opportunities that deliver more value to your customers. With the creation of these programs, you’ll need a way to keep track of everyone’s points and the rewards they can redeem them for. Some third parties offer loyalty program management, while other car wash owners use an integrated program from their POS system. You can also choose what products and services you want to feature in your loyalty program. Depending on your business, you can assign points to items in-store, from gas purchases, and from car washes. Running an unlimited program creates administrative work as well, unless you use software that can verify members and automatically bill your customers. Car-wash-specific POS systems usually have software for this, which saves the headaches of account management and monthly billing. Unlimited programs represent a unique growth opportunity: some users end up paying for the monthly service but never show up to use the service. This produces pure profit for the car wash while keeping customers happy with the convenience of the service. A shift in consumer behavior has resulted in a strong interest towards monthly memberships without any redemption of the service. Depending on the format, a car wash represents a 24-hour profit center. Many car washes can run unattended, allowing for all day, all night operations even when your staff is away. This autonomous model allows for maximum revenue, while minimizing labor costs.